Called “Back Bay” due to its having once been a literal bay before being filled in, Back Bay is now one of Boston's most exclusive neighborhoods. Known for its rows of brownstones, tree-lined thoroughfares, tall buildings, and excellent shopping, Back Bay has a distinctive character due to its extensive architectural planning. It is one of the only areas of Boston to have a grid layout, with alphabetically-named cross-streets intersecting some of the most famous streets in the city: Beacon Street, Commonwealth Ave, Newbury Street, and Boylston Street. Some beautiful historic buildings are here, including Trinity Church and the Old South Church, as well as modern landmarks such as the Boston Public Library's main branch, the John Hancock Tower, and the Prudential Building. With the open-air Copley Square at its heart, Back Bay hosts holiday celebrations, festivals, markets, and other events regularly, and Newbury Street is a premier shopping destination, with high end shops interspersed with tiny art galleries, restaurants, and funky independent businesses. 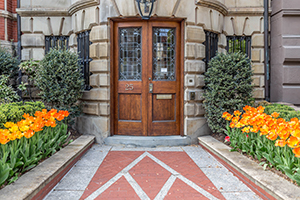 Contact us to ask questions or schedule a tour, or scroll down to browse all real estate listings in Boston's Back Bay neighborhood. Entire third floor condo with two bedroom two baths in a very well kept brownstone on Beacon Street. The unit is renovated and boasts with lots of natural light, high ceilings with moldings, open floor plan with a dining-room area and a gorgeous bay window overlooking Beacon Street. The unit features central A/C, washer/dryer, granite counter tops, gas cooking, hardwood floors, marble bathrooms and a great deal! The best part is, rent includes a large single parking space behind the building. Newly renovated 1 bedroom on Boylston St. in Boston's Back Bay. Directly opposite the Prudential Center, Eataly, shopping, dining, it's all outside your front door! Green line stops 2 blocks away. 2nd floor unit, facing the rear. Kitchen and bath are completely remodeled and building features keyless entry, video intercom and common laundry in the building. Sorry but no pets or undergads. Listed by Kevin Hunt, Valerie Filiberto and Justin Grammer, A & S Realty Co., Inc.
AVAIL MAY 18, FURNISHED one bedroom condo, open layout concept with updated appliances, hardwood floor, fire place and walk in closets. The unit gets great sunlight. Steps to New England College of Optometry (NECO) Short walk to Charles river, Newbury streets, prudential center, public transportation. Laundry in the basement at no charge. Well maintain building and professionally managed. Prices are exclusive of any taxes or utilities. This beautifully furnished 1 bedroom apartment in Back Bay, is available and ideal for short to long-term stays (1-12+ months). Key Features: Designer and custom made furniture, Full kitchen equipment, Quality 5-star hotel mattress, linen & towels, Wide-screen TV, wifi speaker, coffee maker. Building: Fitness Center, Bike Storage, Concierge Service, Doorman, In-building washer & dryer, Parking (for a fee, depending on availability). (ID #BOS89). Photos are from a similar property. Our interior decorating team is currently working on the furnishing. The furniture and equipment will look almost identical, but some differences in layout must be expected. Live on Boston's highly sought after Marlborough Street! This sunny front facing one-bedroom apartment has soaring high ceilings, laundry in building, hardwood floors, and a working fireplace. Single parking space with direct access from the building is included with the rent! Conveniently located near all the amazing restaurants, shopping and beautiful gardens the city has to offer. No Smoking, no pets. The Belvedere offers luxurious full service living in Boston's Back Bay with the finest owner amenities, including 24-hour doorman, concierge, common library/dining room/kitchen and rooftop deck. This 9th floor, 1655 square foot two-bedroom residence offers oversized windows with views of Christian Science reflecting pool and beyond. Other features include a spacious living and dining room open to the high end kitchen with gas range, full bath with marble finishes and in-unit laundry. Connected to the Prudential Center and the Copley Mall, the Belvedere allows residents to live, work and play all within easy, covered walking distance. The building also offers breakfast to residents each day. Includes one garage parking space. More pics to come!! !